If there is anything that can compete with flowers as a gift, it has to be chocolates. Now imagine when they are put together in a single arrangement. We have proved this possible by arranging both of these items together in our Chocolate n Rose Lover bouquet. 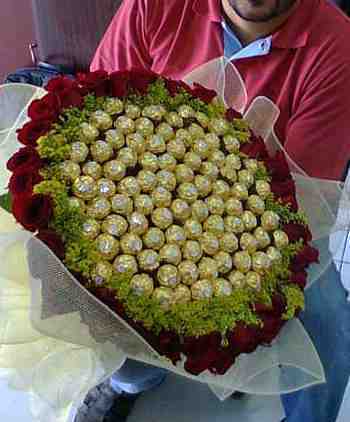 96 imported Ferrero Rocher chocolates are surrounded by the queen of flowers' 50 red roses! Readily delivered within any location in Delhi and NCR, this bouquet will do away with the need for any gift and will take your special one by surprise like no other. Have a Question about Chocolate n Rose Lover Product?